Out of all the social media platforms right now, I am finding Instagram to be the most engaging and rewarding. Yesterday I had a group of holistic nutritionists invite me to their Instagram group, yes we are creating our own community, and they have inspired me with the healthiest recipes for plant-based food – delicious meals as healing medicine for the body. If we haven’t connected on Instagram yet, please say hello @MadelineMarieJohnson I’d love to learn more about what you are up to. Two of the strategies that I find work best include using #hashtags within the 100,000 and 800,000 range. For someone like me this includes #healthandwellness which at the time of this post is at 562,451 and #digitalmarketing 951,149. The second strategy is posting at least four times a day. I am paying attention to Instagram Insights (I have a business page) and find that around 3:00 pm is the golden hour for engagement and likes. The team at Linkedin emailed me a badge of honor yesterday. 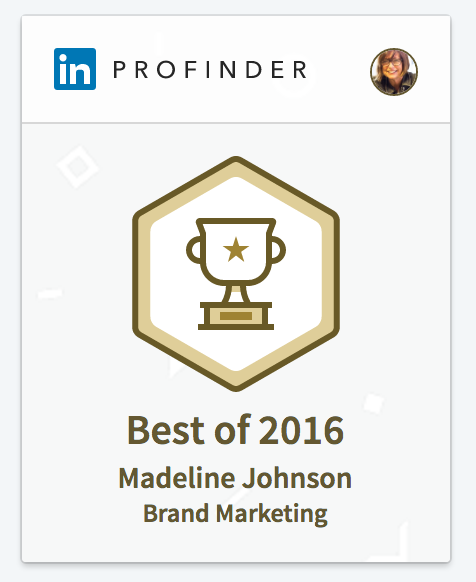 According to the marketing team at Linkedin, the Best of 2016 badge signals a best in class ranking on their platform and spotlights the services I provide on ProFinder. And, if you are looking for a way to grow your business, than check out my online course, www.ThePRPlaybook.com which is packed with PR strategies to take your personal brand to the next level of success. Comment below and ask me for a code to take the course for free.